Sarah Stone was the daughter of a fan painter (“…somewhat in the style of Watteau…”) and was born in London in or about 1760. 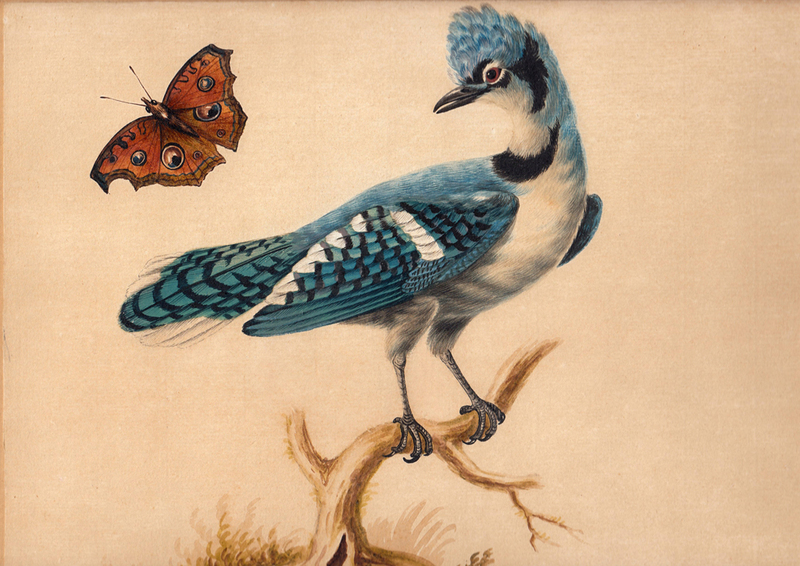 Her initial (and, indeed, probably only) training was from her father, and her technique as a natural history watercolourist reflects the curious demands of the fan-painters’ trade. She usually (as in the present painting) uses a highly prepared (sized) paper, and has a miniscule technique akin to that of a miniaturist, where the emphasis is on a punctilious precision and exactitude, but with a lively palette of well-saturated colours. From the age of about 17, Stone visited the Museum of (Sir) Ashton Lever, a Lancastrian landowner who put together the largest collection of Natural History specimens of the age, and which was open to the public in the vast Leicester House which he rented for the purpose. Lever soon engaged her to paint the specimens for his own use, and over the next fifteen or so years he assembled a remarkable collection of her work. About 900 of some 1,000 of these watercolours survive today, most notably in The Natural History Museum, London..
She married Midshipman, later Captain, John Langdale Smith in 1789, the same year that she painted Australian birds, reptiles and mammals from specimens brought back to England by the First Fleet surgeon John White. These were subsequently published in his work titled Journal of a Voyage to New South Wales. The present work dates to before her marriage on 8th September 1789, when her output of watercolours began to reduce sharply.